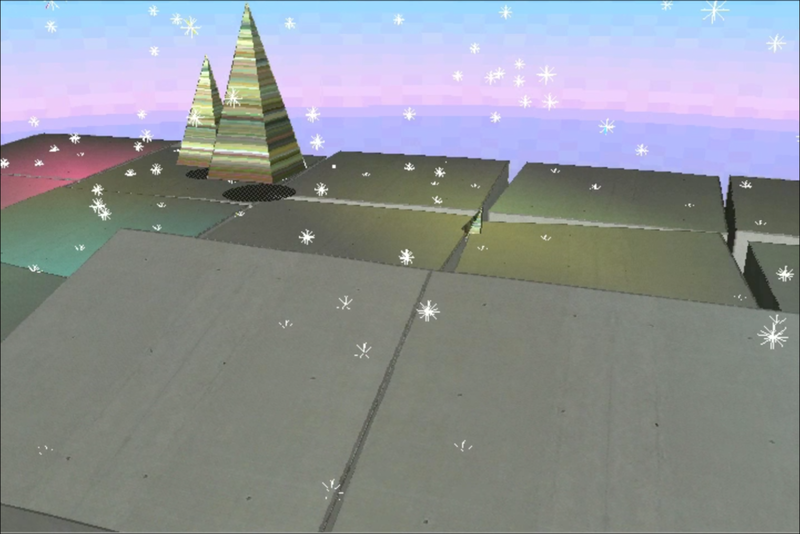 An abstract world in the style of early-game-console-goes-lofi-3d is rocked by an eerie interplay of a simulated earthquake and snowfall. We entirely avoided employing traditional techniques (keyframing etc.). It hardly can be called animation, since it is based on a scripted dynamic system with feedback, and by how it is setup (not even modeled in a traditional sense, just generated by script in the 3d software) it develops independently and yields unpredictable results. It is also not software rendered, just hardware rendered directly from the graphics card, and unfolds live on the screen. For the purpose of presentation a few hours have been screen grabbed and edited into a couple of minutes. Work for the solo exhibition ‘CONSTRUCTING’ at fluctuating images in Stuttgart, Germany.